Let me back up for a second. 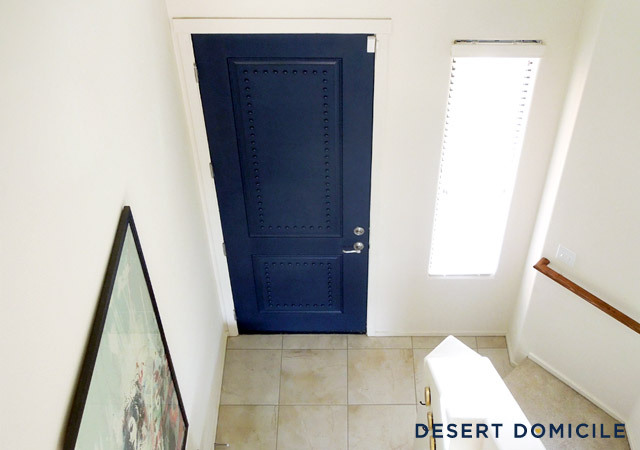 Before I even bought the paint, I tested my door to see if the builder had previously painted it with oil-based paint or latex based paint. How do you test your paint? Dip a cotton ball in some denatured alcohol and rub it on your door. If the paint comes off onto the cotton ball and the door feels tacky when you run your hand over the spot you rubbed with the alcohol, it's latex based paint. 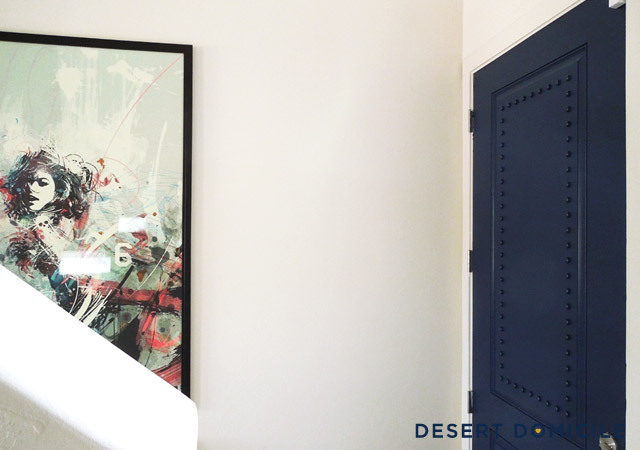 This means you can paint over your door with either oil-based paint or latex paint without having to prime it first. Hooray! 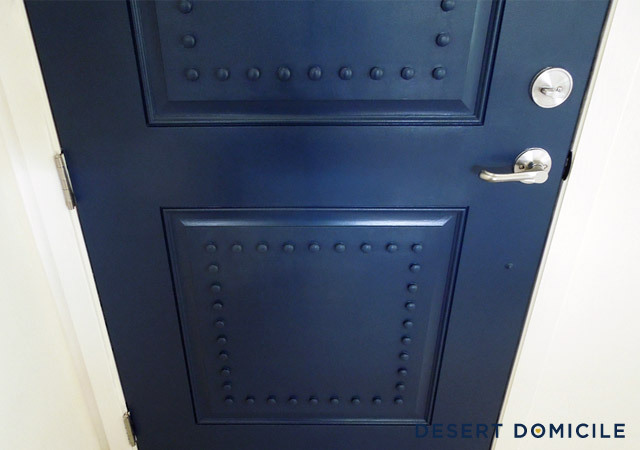 If the paint doesn't come off onto the cotton ball and the door doesn't feel any different when you run your hand over it, you're working with oil-based paint. 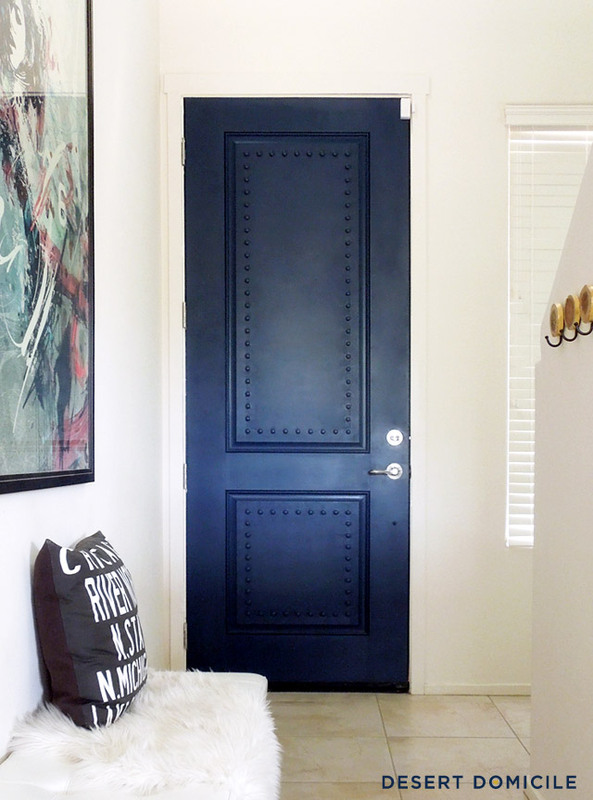 This means you're going to have to prime your door first with oil-based primer because you can't paint over oil-based paint with latex paint – it simply won't stick. If you go ahead and try to paint it anyway, it'll peel right off. Womp, womp. Allison's experience scared me so much that I ended up testing my door in a few places just to make sure that I knew what I was working with (latex paint)! Yikes! The first coat is always the worst so I tried not to worry too much. I sanded the door down with a fine sanding block and then wiped it down with a damp rag. 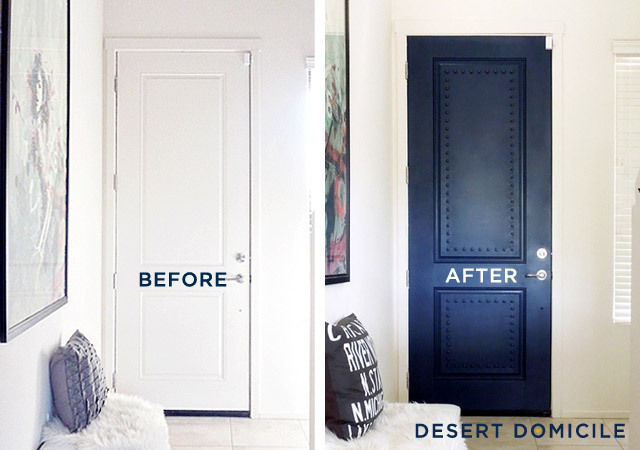 I waited until the door was dry (about 30 minutes) before applying another coat of paint. I'll admit that painting around all of the studs was no fun. 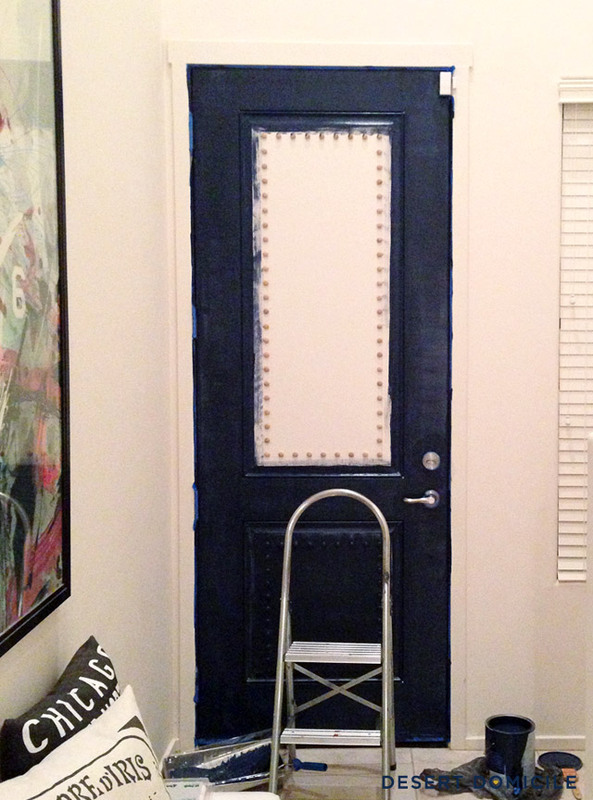 I thought about painting the entire door before gluing them on but I hadn't decided on a color at that point. It's probably a good thing I didn't though since some of the wood glue seeped out from under some of the studs and if I had painted the door ahead of time, I still would have needed to do touch ups. Six of one, half a dozen of the other I guess. The finish isn't perfect but it's about as good as I can get it using a brush and a roller. I'm bummed that you can still see some roller marks even though I added Floetrol to my gallon of paint – Valspar's "Indigo Streamer" in semi-gloss. I'm really glad I went with navy because it is gorgeous! Everyone likes a before and after, right? Not bad for $10 worth of wooden studs and a weekend of painting! What do you think of the transformation? Was it worth the wait to see the after photos? Are you as impressed as I am? It's beyond amazing what huge difference such a little (cheap) update makes. Something most people wouldn't think of but it's totally genius Caitlin. I really mean it when I say I want a door just like it. it's an awesome look! i love it! i've noted that people will pay attention to what's on tv show sets, strangely that i don't but I will now! Haha, her reply is great! I never really used to pay attention to TV show sets but I have been a lot more lately. Some of those set designers do such a great job, it's hard to ignore their work! Looks great! I love the color! It's amazing! I am totally in love with it. I do love it! The outside needs to be the same! Afterall, TBB door is on the outside! Thanks Jennifer! The color turned out perfect! I think you got big bang for your bucks there. 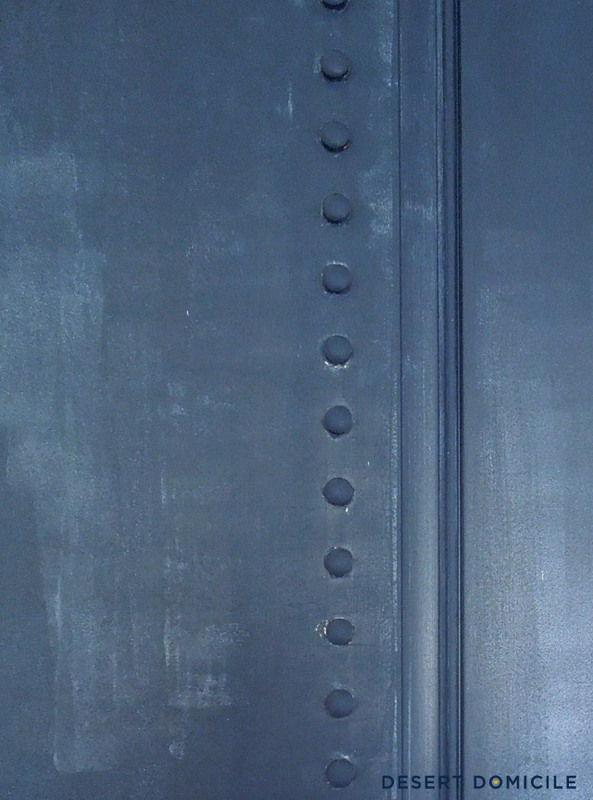 Love that door. It looks amazing and original. Love the color!!! This is amazing! If it didn't involve me replacing my entire front door I would do this in a heart beat! Love love love! Navy was a great choice (when is it ever a bad one...eye makeup probably). I love the studding. It looks incredible! Holy smokes lady that's awesome! Quick question? What finish is the paint? Also, did you have to prime it first? Our door is that standard builder kinda glossy beige. I want to paint it with latex paint but Im afraid of the paint peeling off. Before I even bought the paint, I tested my door to see if the builder had previously painted it with oil-based paint or latex based paint. 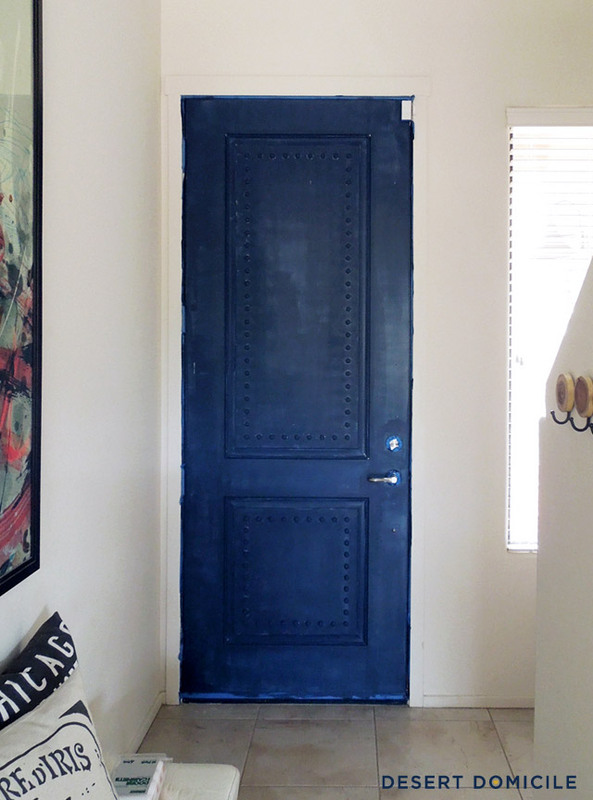 If the paint doesn't come off onto the cotton ball and the door doesn't feel any different when you run your hand over it, you're working with oil-based paint. 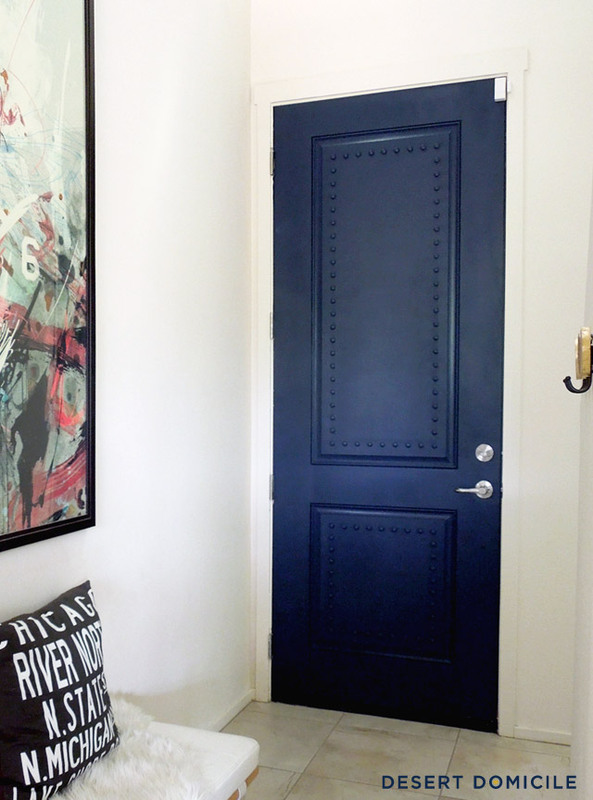 This means you're going to have to prime your door first with oil-based primer because you can't paint over latex paint with oil-based paint – it simply won't stick. If you go ahead and try to paint it anyway, it'll peel right off. Womp, womp. I seriously cannot believe how amazing this is! Your creativity blows me away. This is the best front door I've ever seen :) Sheldon would be so proud! I love that color. A lot. We bought a paint sprayer a couple of weekends ago. Totally a good investment! Thank you! If you don't mind me asking, which paint sprayer did you get? Beautiful! Curious why you had to sand down the first coat. I've never painted with oil-based paint so forgive me if it is an obvious question! Hey there! Kenz told me to come over in lieu of reading her latest non-existant post & I'm glad I did. 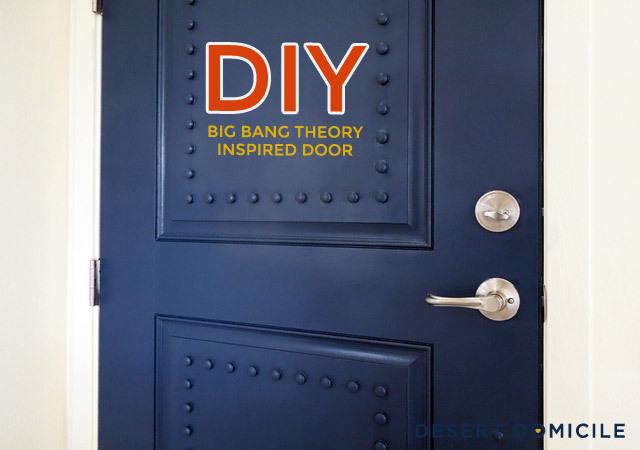 I <3 all things BBT and have secretly coveted that door. So glad someone finally knocked it off! As far as the roller marks - that's because of the finish. Try some soap & water and 0000 steel wool. Dip it in, lightly buff those areas & see if they don't disappear completely. And Becky C (comment above mine) you want to sand between paint coats (oil, latex, acrylic) to get out any imperfections before applying the next as it's much harder to get them after there are layers of paint holding them in (be sure to tack cloth or suction vac any sanding dust!). I'm going to go right ahead & add your blog to my list & check back soon. I should prob send Kenz a thank you for introducing me to your blog as well. Cheers! Welcome Dee! Tell Kenz I said thanks for sending you my way! I'll have to try your steel wool mark removal method and see what happens. Is there a specific soap to water ratio I should use? LOVE IT! You did an awesome job, and the wooden nubs are a really cool touch. "If the paint doesn't come off onto the cotton ball and the door doesn't feel any different when you run your hand over it, you're working with oil-based paint. 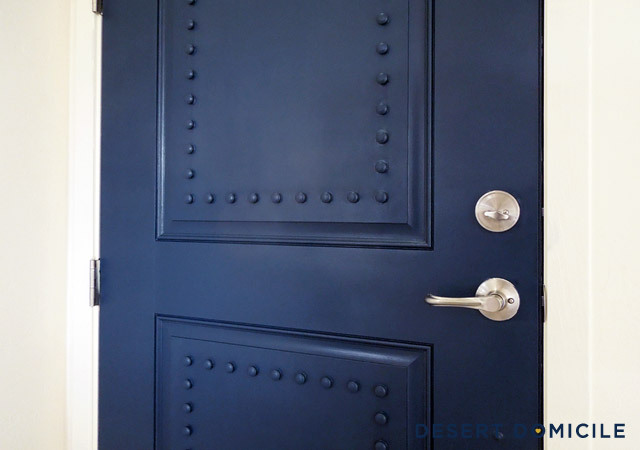 This means you're going to have to prime your door first with oil-based primer because you can't paint over latex paint with oil-based paint – it simply won't stick." Shouldn't that say "you're working with oil-based paint. This means you're going to have to prime your door first with oil-based primer because you can't paint over OIL-BASED paint with LATEX paint"??? Oh this is so, so crazy good! Sharing on FB! now this is a great door! great color choice. (although i would be nervous after that first coat too!) and so glad you did the DI big bang theory style. love it. Ooooh! Very nice! I love how it's unique and unexpected. Pinning! Looks so good with the added texture, and of course the colour, too. I had to stop by and comment (again) - your door just looks so fab! And your tutorial was great! Awesome! Wow! Amazing. That before and after is just amazing. Accidentally commented using my wife's google account. Whoops! Anyway, brilliant project! such a fabulous idea, and I LOVE that color, too! Can you tell me where you got the hardware from and how you applied it? I covet your door. It is GORGEOUS and you are BRILLIANT. Your door looks great. I heart the Big Bang Theory--never fails to make me laugh. Your door looks incredible! It has such character and makes a bold statement that I love. Plus I'm a huge Big Bang Theory fan so that makes me like the door even more. Would you mind to link this up to the Frugal Crafty Home Blog Hop? Our readers love to see DIY projects like this! Love it Caitlin! Big fan of Big Bang too! hi! this looks great!!! What color did you use?